Swing the ball to knock down the skittles. 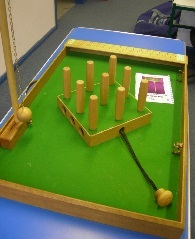 Pole with swinging ball, which fixes onto board. Draw string to re-set the skittles. Built-in score board and pegs. Sturdy table to play the game on. Prizes, if you are using the game as a fair stall.